What a session it has been for binary options traders this Wednesday. As usual chairman Bernanke delivered a huge load of volatility with his comments. Stops have been breached in all directions in most of the pairs, but we will turn our attention to the EUR/USD again because as we all know very well it’s our bread and butter in currency markets. The pair kicked off trading in the US session at $1.2935 and initially traded lower to $1.2916 on broad dollar demand exacerbated by USDJPY breaking above 103.00. Just ahead of the Federal Reserve chairman’s testimony the rate had tested briskly the top of the daily range and was trading at $1.2945. Bernanke's prepared testimony was taken as a rather dovish tone and the greenback was sold off across the board with the main words ringing in the media being that "premature tightening would be a risk to the recovery". The EUR/USD was sent to a high of $1.2998 before consolidating. As it turned out this was the opportunity that binary traders were looking for to buy dollars at better levels and even before the start of the Q&A session the EUR/USD was trading around $1.2950. Following some comments that the FED is likely to start tapering off its bond buying program in the next few months the dollar was bought briskly across the board. 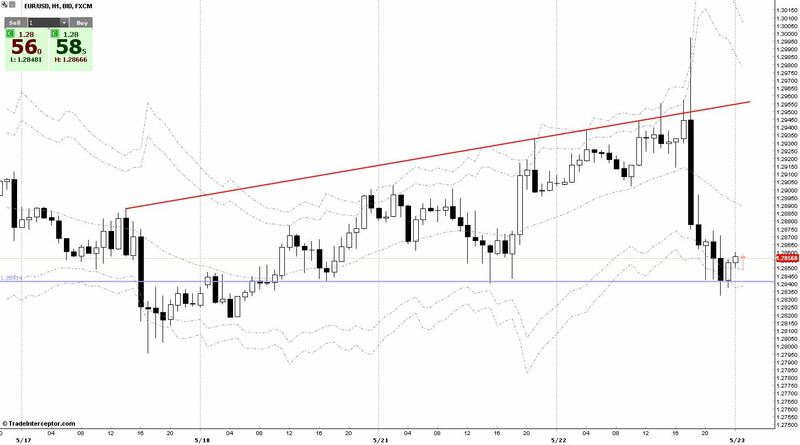 Despite the fact that these words are not signaling any decisive move from the Federal Reserve, the market just seemed to be willing desperately to buy dollars so as a consequence the EUR/USD dropped around $1.2840 forming a triple bottom. Looking at the chart we observe 1.2840 as a very strong level – expect the move downward to go on if the rate manages to close on a sustained hourly basis below 1.2840. Once this happens switch to selling puts on any rally. Alternatively, if the rate manages to claw back up towards 1.29 we would be cautious on selling rallies. Tomorrow morning the market will be paying close attention to flash EMU PMI for May. Consolidation around the weak levels is expected to continue with consensus estimates for 47.0 for the manufacturing sector of the economy and 47.2 for services. If data materializes around consensus we do not expect a rally for the EUR/USD. Bearish sentiment would only be broken if we see much higher numbers closer to 48.0.